Habits that will lead to your success! 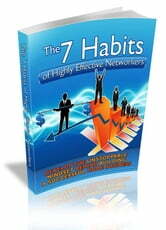 This book is based on Stephen Covey’s timeless principles called “The 7 Habits Of Highly Effective People” but is catered for network marketers. At every step in your network marketing game, you must fall back on The 7 Habits Of Highly Effective People and see how you can apply those ideals to your venture. When you grow as a leader, you are sure to bring more people the network and keep them motivated to work for the greater good of all.